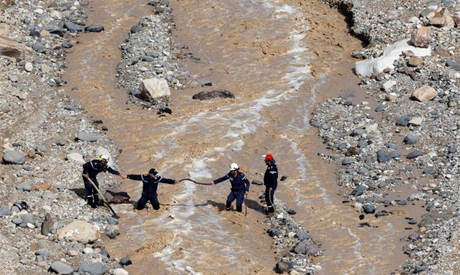 A further 35 people were injured following heavy rains on Thursday, including members of the security forces involved in rescue operations, said an official from the civil defence -- Jordan's fire service -- who asked not to be named. "Most of the dead were schoolchildren aged 11 to 14 who were taking part in a school trip to the Dead Sea region" when their bus was swept away by floodwaters. "Security force personnel who were taking part in the rescue operations were among the injured," he added. Education Minister Azmi Mahafzah promised a "full inquiry" into the schoolchildren's deaths. Roads leading to the area were closed on Friday morning "to allow the continuation of search and rescue operations", the Directorate of General Security said.